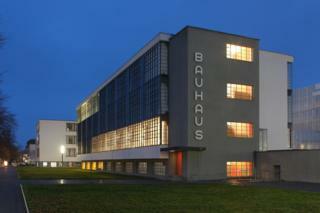 The Bauhaus art school in Dessau, Germany. Established in 1919, in the wake of World War One, Germany’s Bauhaus art school brought a radical new approach to design and aesthetics which would eventually go on to help inform modernist architecture around the world. Now in its centenary year, we look at a selection of some of the buildings shaped by the influential art school. A view inside the Bauhaus building, which is now a Unesco World Heritage site. Not far from the school, Gropius also designed identical semi-detached houses for the Bauhaus masters. The Bauhaus aesthetic combined form, function and efficiency and soon became evident in buildings around Germany. Designed by Carl Fieger, the Kornhaus was built on the Elbe River in Dessau in 1930. The Zollverein Coal Mine Industrial Complex in Essen, Germany. Designed by Fritz Schupp and Martin Kremmer, the building’s simple combination of form and function is typical of the Bauhaus philosophy. One of Gropius’s early works, the functional design of the Fagus Factory in Alfeld, Germany, foreshadowed many elements of the Bauhaus aesthetic. Under pressure from an increasingly right-wing government, Meyer soon stood down and was replaced by architect Ludwig Mies van der Rohe (1886-1969), who began placing greater emphasis on architectural design. As support for the Nazis grew, the school began to be seen as being at odds with National Socialism and students and teachers were forced to flee to a new base in Berlin. When Adolf Hitler became chancellor in 1933, the school was closed down. Driven into exile, many key figures of the Bauhaus emigrated to the US and Middle East, where their philosophies inspired generations of architects and designers. After relocating to the US, Gropius designed a home in Lincoln, Massachusetts. Gropius was joined in the US by other Bauhaus teachers such as Ludwig Mies van der Rohe, Josef Albers, Herbert Bayer, Walter Peterhans and Laszlo Moholy-Nagy. Mies van der Rohe designed the SR Crown Hall at Illinois Institute of Technology, Chicago, which was completed in 1956. A Bauhaus building in the White City in Tel Aviv, Israel. As refugees arrived from Nazi Germany in the 1930s, Bauhaus-trained architects designed thousands of apartment buildings. Now a Unesco World Heritage site, the buildings in Tel Aviv’s White City were adapted for the intense sunlight and feature few architectural flourishes. The 100 Years of Bauhaus festival runs from 16 to 24 January 2019 at the Berlin Academy of the Arts in Germany.